I’ve tried a ton of Gmail clients over the years on a bunch of different platforms, and the best have always been those that Google makes for its own Android devices. This is why it baffles me that it can’t seem to release one for the iPhone that is worth a crap. Well, you can finally install a Gmail app for iPhone that brings you almost every feature you would want in an experience that you’ll love. But it isn’t coming from Google. 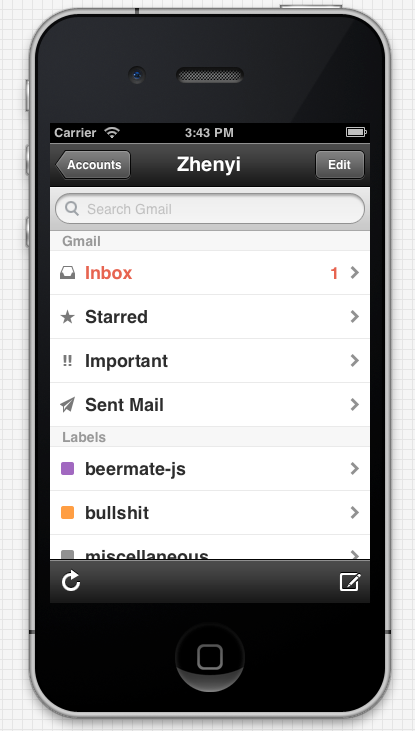 Sent [App Store, $4.99] is a Gmail client for the iPhone created by Zhenyi Tan and it’s pretty great. It’s a client that incorporates a slick UI with most of the things that people are hot about Gmail for like starring, important messages, flags and more. But most of all, it’s super fast, with a liquid smooth interface that rivals Apple’s own Mail.app, but with a distinctly Gmail flavor. Labels are here, as is full-email search with operators. You have access to all Gmail folders, including Drafts, All Mail, Spam and Trash, right on the first page. This is a revelation for those of us that jump back and forth between folders a lot. No more in and out and taptaptap just to get around your Gmail inboxes. The composition interface even has a sweet ‘attachment’ button to add photos. 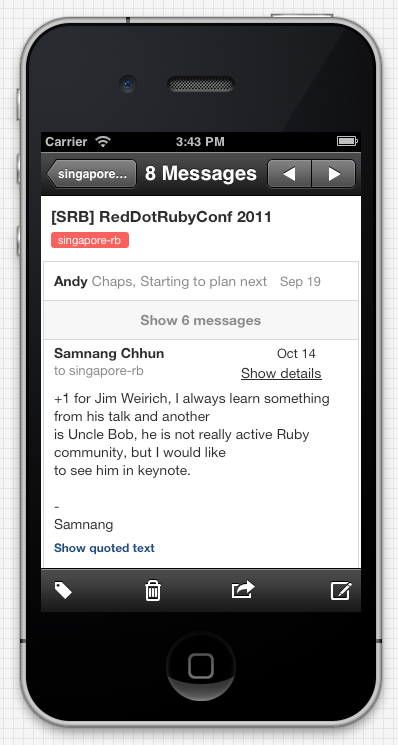 There is also a legitimately ‘Gmail-esque’ threaded conversation view. Mail.app does an OK job with conversations, but if you’re much happier with the vertically threaded conversations in Gmail, you’ll love how Sent handles them. But if we’re going to pin down the star feature of Sent, it has to come back to the speed. Yes, it is a native app, so it handily beats out the performance of the Google Gmail app, which lazily relies on a webview for the main chunk of the interface, but it’s not just ‘native app’ fast, it’s really, really fast. The only app that I’ve seen react with the speed and ‘tap fluidity’ that Sent does is the brilliant messaging app Verbs, which is my favorite Gchat and IM client. It’s blazing. It’s not perfect though, as I experienced several crashes while working with it, especially while adding accounts, but Tan seems intent on making this a great app, so I’m hopeful it will gain stability over time. Once accounts where added, the experience was pretty solid. The app is also missing push notifications, which many feel is an essential part of a Gmail experience on the iPhone. Tan says that he, or she, is working on implementing push, but as it is a one-person shop, setting up a push server is a bit of a challenge. iPad support is also on the way, as are other small missing features like ‘send as alias’ and a full Priority Inbox (although the Important!! section doubles as one). You can choose which inbox to use as default, and which one to use as the ‘reply from’ as well, which is a must for multiple accounts, but there is no unified inbox as of yet. I have all of my email go to one inbox and just add the others as ‘send from’ options in Mail.app anyway, so this works for me, but it might be a bummer for some with completely segregated accounts. 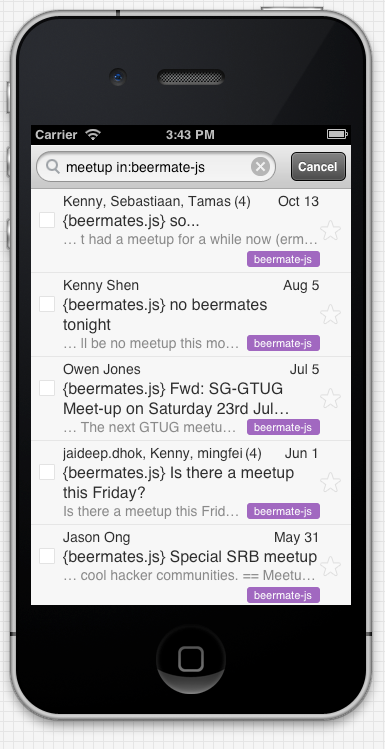 Beautiful, well featured and fast, Sent makes a case for being the best Gmail client on the iPhone right now. As long as Tan continues to improve on the stability of the app, and gets features like push working, Gmail users could have a major contender for a Mail.app replacement on their hands. That is, unless Google hires them first.